Some people use highlighters. Other folks scribble in the margins. (and more than likely totally enjoyed) a book, is to look at the number of pages that I have dog-eared. If there are lots of pages folded down at the upper right hand corner, then it's a clear sign that there's something on that particular page that I need to re-read and savor a second (or third) time. The truth is that I read The House on Crash Corner cover to cover one recent afternoon while lounging in the warm spring sunshine on my front porch. As I glance at the book now, sitting closed on the corner of my desk, there are far too many dog-eared pages to count. The House on Crash Corner features a series of 18 personal essays written by a clinical psychologist who worked with cancer patients at Sloan Kettering before being diagnosed with breast cancer herself. With each essay, Dr. Greenstein invites the reader into her life to experience up close and personal some of the many hats she wears: a clinician counseling a lung cancer patient in denial, a daughter chatting with her parents in Yiddish, a newly diagnosed cancer patient being examined by a breast surgeon. The tone is warm and authentic. The mood swings from humorous to crisis- filled in an instant — just like real life! I felt swept back in time on more than one occasion. When she described a conversation with her Eastern European parents that was filled with Yiddish phrases, I could almost smell my grandmother's chicken soup cooking on the stove in her Brooklyn apartment so many years ago. When she walked through the steps leading to her stage II breast cancer diagnosis, I revisited my own difficult moments in the examining room. it was the size of the needle that made the biggest impression... the moments of pain were actually very short compared with the pain I put myself through by thinking about it ahead of time. If she could stay focused on the present no matter what she was doing...up until the moment the needle actually pierced her skin, she could cope. Even more, if she could keep that same focus from meandering to thoughts about what lay ahead in the future in general, she could continue to make the most of every moment that was not painful. 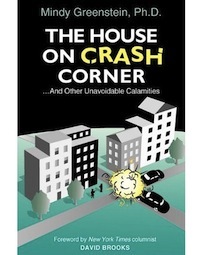 The House on Crash Corner is a great read, relevant to many different audiences. Cancer survivors will certainly see their own experiences reflected here. Clinicians will also benefit from Dr. Greenstein's insights as both a doctor and patient.